Behavioral problems are a common concern for anyone who suffers from any sort of cognitive impairment. Anxiety, agitation, aggression, and even combativeness are common in those who suffer from dementia. When dealing with these behavioral problems, it is important to be mindful of your own reactions to the situation. Typically, these behaviors are simply symptoms and an outward reaction to internal conflicts. Most of us have learned to control our urges, regulate our actions despite our mood, and even filter what we do and say to deliver the appropriate social response. The mind of a dementia patient has lost the ability to do these things. It is not uncommon for the dementia patient to have good days and bad days, which can make dealing with “outbursts” more difficult for those who love them. Some dementia patients even suffer from sundowner symptoms, where the daytime can make them feel, think, and seem like their normal self, while as the day wanes on, dementia symptoms can increasingly become more present. Dementia can be very confusing and frightening for the person experiencing it. Imagine being lost in your own mind, and when you have lucid moments, not recognizing anyone or anything and being confused about where you are what you are doing. Chances are, you would not react with a pleasant attitude and smile on your face either. But, not to fret, you and your loved one are not alone. There are more than 50 million people who suffer from dementia and memory care is not a new art. Join us in today’s post as one of our experienced memory care nurses offers some tips on how to prevent and react to behavioral problems in the dementia patient. It is true, everyone has good days and bad days — you and I are not exempt. The same is true with the dementia patient. Alzheimer’s disease (which is responsible for nearly 70% of dementia) is not a black and white disease. There may be days where your loved one is completely aware of everything, to include their cognitive decline. And, then, there may be days where your loved one is in the mindset of their 13-year-old self, and other days completely cognitively unrecognizable. While there is little that you can do to ward off confusion or other symptoms of dementia, there are ways to help prevent behavioral challenges. Routine helps to prevent behavioral problems and create a predictable, reliable environment for people of all ages and mental states — and pets too! Routines help to set expectations, guide direction and purpose, and helps to reduce mental strain. We are not suggesting that you become obsessive-compulsive or set rigid routines, but providing structure and some sort of schedule helps to reduce anxiety, provide direction and comfort, and instill a sense of calm in the cognitively impaired. Each day does not need to play out exactly the same. In fact, variety is the spice of life! However, some things should be routine. For instance, waking up around the same time each day, performing the same hygiene steps and toileting rituals, and then eating a meal should be fairly mindless. Meal times, sleep times, and active times should be fairly consistent day-to-day. This helps not only at a cognitive level, but also helps support the natural circadian rhythm, which can actually help level out moods. If your loved one does not have a routine, start one today! Every human being has basic inherent needs — food, elimination, comfort, stimulation, sleep. When a person suffers from dementia, they may feel uncomfortable and not sure why. They may be unable to identify their needs or express them. This general discomfort can then manifest as frustration that causes sudden outbursts. Something as simple as a waistband that is too tight, a full bladder, or a hungry belly can create agitation. Anticipating the needs of a dementia patient can help thwart discomfort and the ensuing agitation. You can help by taking note of when they last ate, when they last used the restroom, the activities they have participated in, and the environment. Be attentive to their needs and anticipate them beforehand. Offer regular toileting, snacks, position changes, and distracting activities that keep them engaged. Stay tuned for part two of this two-part series when we discuss some of the ways to react to and deescalate behavioral problems in the dementia patient. 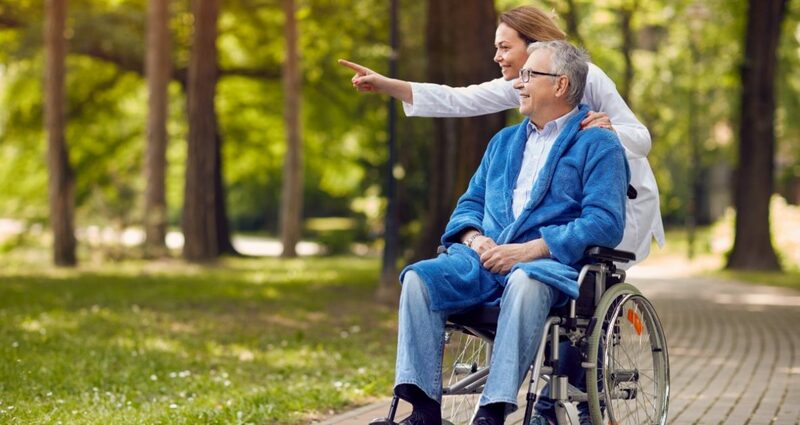 If your loved one suffers from Alzheimer’s disease or another form of dementia in Friendswood or Dickinson, contact our home-like memory care assisted living facility for the support and care that you and your loved one deserve!